As the fiftieth anniversary of the first lunar landing approaches, the award winning historian and perennial New York Times bestselling author takes a fresh look at the space program, President John F. Kennedy’s inspiring challenge, and America’s race to the moon. On May 25, 1961, JFK made an astonishing announcement: his goal of putting a man on the moon by the end of the decade. In this engrossing, fast-paced epic, Douglas Brinkley returns to the 1960s to recreate one of the most exciting and ambitious achievements in the history of humankind. American Moonshot brings together the extraordinary political, cultural, and scientific factors that fueled the birth and development of NASA and the Mercury, Gemini and Apollo projects, which shot the United States to victory in the space race against the Soviet Union at the height of the Cold War. Drawing on new primary source material and major interviews with many of the surviving figures who were key to America’s success, Brinkley brings this fascinating history to life as never before. 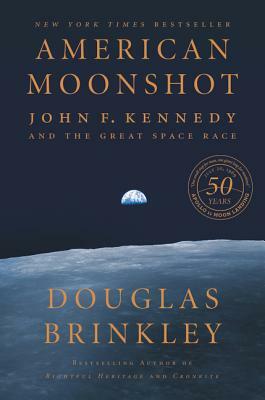 American Moonshot is a portrait of the brilliant men and women who made this giant leap possible, the technology that enabled us to propel men beyond earth’s orbit to the moon and return them safely, and the geopolitical tensions that spurred Kennedy to commit himself fully to this audacious dream. Brinkley’s ensemble cast of New Frontier characters include rocketeer Wernher von Braun, astronaut John Glenn and space booster Lyndon Johnson. A vivid and enthralling chronicle of one of the most thrilling, hopeful, and turbulent eras in the nation’s history, American Moonshot is an homage to scientific ingenuity, human curiosity, and the boundless American spirit. Douglas Brinkley is the Katherine Tsanoff Brown Chair in Humanities and Professor of History at Rice University, a CNN Presidential Historian, and a contributing editor at Vanity Fair. In the world of public history, he serves on boards, at museums, at colleges, and for historical societies. The Chicago Tribune dubbed him “America’s New Past Master.” The New-York Historical Society has chosen Brinkley as its official U.S. Presidential Historian. His recent book Cronkite won the Sperber Prize, while The Great Deluge: Hurricane Katrina, New Orleans, and the Mississippi Gulf Coast received the Robert F. Kennedy Book Award. He was awarded a Grammy for Presidential Suite and is the recipient of seven honorary doctorates in American studies. His two-volume, annotated Nixon Tapes recently won the Arthur S. Link–Warren F. Kuehl Prize. He is a member of the Century Association, the Council on Foreign Relations, and the James Madison Council of the Library of Congress. He lives in Austin, Texas, with his wife and three children.